Nancy has just completed the first leg of her book promotion tour, kicking off with a book launch party and signing at Uptown Birds in Manhattan, along with a 21 city radio satellite tour while in New York. After New York, she did two California book signing events, one at Kepler's Bookstore in Menlo Park, then on to Capitola Book Cafe in Capitola where enthusiastic readers filled the space and spilled over into the rest of the bookstore. On August 4, Nancy did a 30 minute interview with Denny Smithson on KPFA, and is on to more in-studio interviews in both San Francisco and Oakland, where she will also tape for FOX network. August 10 was her gala book party in her hometown, Willits, where 100 people are expected. See photos from the event! August 19 was her book signing at Book Passage in Corte Madera. Beyond that, 14 additional cities are being targeted for book signings in September and October. Enthusiastic reader responses from all over the country arrive daily, along with newspaper reviews which continue to praise the book. Nancy Ellis-Bell is now representing as an agent national pet expert, Marc Morrone, who appears regularly on The Martha Stewart Show, along with her Sirius Radio Show. Nancy Ellis-Bell is now in discussion with a major network to develop a series on people and their parrots, including celebrity parrot owners. 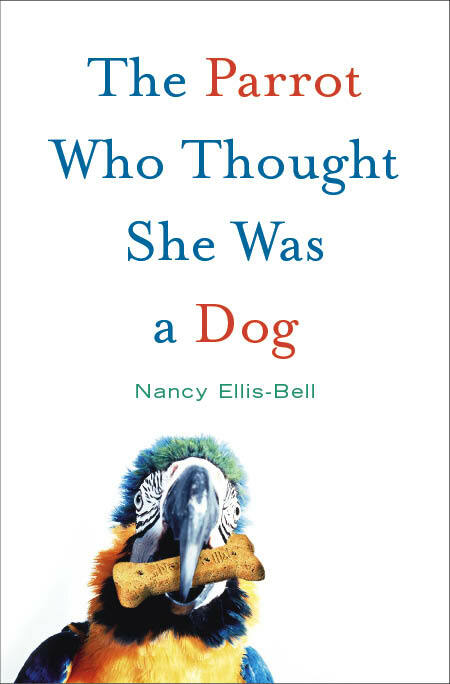 "The Parrot Who Thought She Was a Dog" debuts on July 22 with two launch events in New York, followed by another event in northern California, and a series of book signings throughout California and the West. The author will also be conducting a radio satellite tour on July 22 while on her trip to New York. Dutch rights for "The Parrot Who Thought She Was a Dog" have been sold at auction to Mistral uitgevers. The Dutch translation of my book will now include an announcement /advertisement for the N.O.P., the Dutch Foundation for the Refuge and Care of Parrots Other rights negotiations are in process. At the recent Book Expo event in Los Angeles, Nancy spent time with Joan Embery whose new pet care manual from Merck is now the most comprehensive guide for all pet owners, including those with birds. The two women shared stories about their scarlet macaws, and how unusual they are given the nature of this generally temperamental breed. Both women's birds will "step up" on other people and don't try to bite - unlike Marc Morrone's scarlet macaw, Harry, as seen on The Martha Stewart Show where Marc is Martha's favorite pet expert. When Martha asked to hold him, moving closer to Harry's perch on Marc's shoulder, she was reminded that he would bite. When I met with Marc at this Parrots of the World pet store in Long Island, I could tell by looking at Harry's eyes that Marc wasn't exaggerating. Joan and I did concur that the eyes have it all, and that one should always be alert to those little windows to the soul. Also at Book Expo was my own book and multiple stacks of bookmarks which Show attendees loved. Parrot book buzz was everywhere from big mainstream publishers to smaller companies and even into children's books. Looks like next year in publishing will be The Year of the Parrot. Although my book doesn't hit bookstores until July 22, Marc Morrone is already promoting it on his radio shows. Thanks, Marc! Beautiful parrot tee shirts will be available when the book is released on July 22. 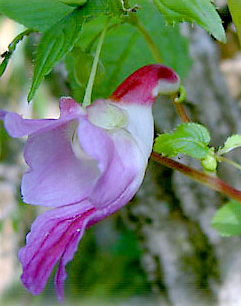 This is a Parrot Flower native to Thailand. It is a protected species and resembles a parrot quite vividly. This flower can not be exported from the country so this is a rare opportunity to see such an amazing sight. A stray parrot was reunited with its owner in Japan after repeating its name and address at the local veterinary clinic that took it in, police said. Police captured the red-tailed African Grey, Yosuke, earlier this month after a woman called to say it was sitting on a fence in her backyard near Tokyo. The parrot was then handed over to the animal clinic to be cared for. It began by greeting people and singing popular children's songs, before repeating its name and address. Police matched the name with its owner, who was reunited with Yosuke earlier this week. The parrot had become lost two weeks ago after flying out of its cage in Nagareyama city, Chiba prefecture, near Tokyo. "I'm glad I had taught him my address and name," the Daily Yomiuri newspaper quoted his owner as saying. The African Grey parrot is considered one of the most intelligent birds and is said by experts to have the cognitive ability of a six-year-old.